GTU Innovation Council is one of the esteemed organization in the field of innovation and Entrepreneurship. 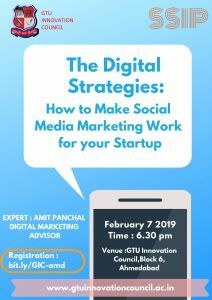 GIC is Conducting a focused review session on Digital Marketing Startegies for Startups by Mr. Amit Panchal, Social media influencer on 7 February , 2019 at GIC Block 6. The session on Digital marketing strategies will Provide Guidance to Startups , Entrepreneurs in Promoting their startup/ Product / Brand via different social media platforms. Note : Startups are advised to send their queries regarding digital marketing in advance so that i can share with the expert.